Node red uses a settings file called settings.js located in in the user .node-re folder in their home directory. You can create your own settings file and customise it either by copying the existing file or using the file available from Github here. On Linux the settings.js file is copied from the /usr/lib/node-modules/node-red/ folder to your .node-red folder in your home directory when you start node-red and no settings.js file is present. On windows if no settings.js file is present in the home folder then the node-red start process stops with an error. 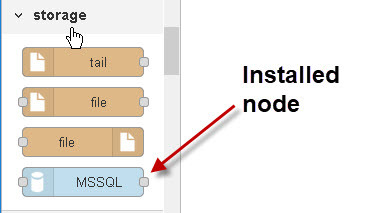 To use your own settings file use the -s switch when starting node-red e.g. If you place a settings.js in the .node-red folder that will be used by default. The -p switch will let you change the port the node-red admin interface uses. Flows that you create are stored by default in a file in the .node-red directory of your home folder in a file called flows_severname.json. The file is created when you run node-red for the first time and is loaded when you run node-red. EG. for my raspberry pi the file is flows_raspberrypi.json. You will also see these files. flows_raspberrypi.json.backup – This is a backup of the flows_raspberrypi.json file. and functions like a word backup. When you do a deploy the old flows_raspberrypi.json file is moved to the backup file and the flows_raspberrypi.json is overwritten. This means that you can recover from a mistake if you notice it after 1 deploy by using the flows_raspberrypi.json.backup file. flows_raspberrypi_cred.json. – This file contains login data used by some nodes. If it is not present the flows will still work but you will need to add the information back in to any nodes that need it. flows_raspberrypi_cred.json.backup – Backup of flows_raspberrypi_cred.json and functions the same way as the other backup. All of the flows in your workspace are stored in the flows file. You can copy all of the flows by copying the flows_newmachinebane.json. file. To use them on another machine change the file name to flows_newmachinebane.json. The only file you really need is the flows_raspberrypi.json file however you should also copy the flows_raspberrypi_cred.json file. See this github page for other important files and folders. You can created additional flow files for storing different workspaces. In order to do that you will need to create a new settings file and edit it. Edit the settings file to point to the new flows file and remove the two forward slashes. You can administer node-red from the command line by installing the node-red-admin tools. Even though you may not want to administer node-red this way you will need the tools if you need to create passwords for node-red users. There are three places were you can configure authentication. In the node-red editor go to menu>manage palette and click the install tab and then type the package name or type in the search box to search for a package.